At Burgess Hill Girls, Classics is alive and buzzing as a discipline that is highly relevant to the modern world. By exploring our past we gain a clearer picture of the present and a greater understanding of context. Our subjects develop a broad range of important skills, linguistic, analytical and evaluative, for example, whilst exploring fascinating civilisations that continue to influence the West and the world as a whole. They delve deep into what it means to be human. Whether you are seeking answers to the ‘Big Questions’, want to lose yourself in some of the finest stories ever told or simply enjoy a linguistic challenge, Classics and the Ancient World have something for you. For many of our students a real highlight is participating in one of the overseas trips where Classics gets up close and personal. From the birthplace of Hercules and the dizzy heights of the Parthenon to exploring the ruins of Pompeii and Herculaneum and the wonders of Rome, the girls experience the ancient world first hand. Back in the UK, our students continue to explore Classics outside the classroom and we offer many enrichment opportunities, such as university competitions, workshops, visiting speakers, theatre trips and site visits. We are also one of the few schools proud to offer Classical Greek as a co-curricular activity. In the classroom, our students study both the language and the culture of the Romans. In KS3 we follow the Cambridge Latin Course and girls enjoy the rigour and intellectual flexibility needed to translate and explore the stories and interactive language activities and explore cultural links. They soon become experts on gladiatorial combat and what to cook for a Roman dinner party, and learn about the structure and beliefs of this multicultural society. The skills they need to do this are vital for the modern world. In Ks4 and 5, our students are privileged to read in the original some of the works of famous authors such as Virgil, Ovid, Cicero and Tacitus, which have inspired many later generations. As they develop their skills of literary criticism and communication and their linguistic prowess, they may read one of the greatest love stories ever told or find themselves in a court room with an orator whose brilliance has survived through the millennia. Our students of Classical Civilisation study Homer and ponder on the true meaning of heroism whilst the consummate storyteller weaves his web. There are also the delights of Greek tragedy which deals with the big questions in life; to whom do you owe ultimate loyalty? How far should you go to support your country? What is the cruellest revenge? Not for the faint-hearted, our students explore betrayal, lust for glory and brutal murder. Some students take up the exciting opportunity to study Classical Greek. They enjoy learning to read and appreciate Greek literature, by authors such as Herodotus and Homer in its cultural context and in its original language. Whatever you love, Classics has something for you. French is an obvious language to learn as France is a major trading partner of the United Kingdom and a favourite holiday destination. The Francophone world, French culture and customs are an inherent part of the course and every opportunity to introduce the students to French society and way of life is actively sought: French breakfast, films, websites and Years 9 and 10 have the opportunity to discover life in the south of France with the French Exchange trip to Avignon. Our aim is to make learning French a rewarding experience by giving the students the necessary tools to be able to express themselves in writing and orally confidently and accurately. Our state of the art language laboratory gives the students the opportunity to have genuine conversations and hone on their listening skills. Our French Assistant, a young graduate, teaches small groups at KS4 to help student be competent communicators. We use Mission: français in Years 7 and 8, Clic! in Year 9 and the Nelson Thornes course for GCSE, together with Kerboodle. All courses provided students with interactive activities and audio and video resources. German, the language of Philosophers, Scientists, Writers and Musicians, Artists and successful Sportsmen and women is also the first language of the European economic powerhouse. It is introduced at the end of Year 7 and pupils can then opt to continue in Year 8 and all the way through to A Level. All the classes are taught by a specialist linguist. We use the interactive version of the Echo Express course from Heinemann for KS3, and the Nelson Thornes AQA course for GCSE and A level, in conjunction with the online resource ‘Kerboodle’. A developing relationship with the German department at the University of Cambridge which has enabled us to meet the German translator of Harry Potter and support from our German language assistant are ways in which we help pupils gain confidence and achieve their aims. Enthusiastic linguists across all languages are encouraged to take part in the annual national Linguistics Olympiad. In 2014 and Upper Sixth student was a gold medal winner in the International Finals in Beijing. Spanish is taught by native speakers and by bilingual staff whose knowledge of Spanish far exceeds the level normally required for teaching at A Level. Our combined experience ranges from primary schools to three prestigious Russell Group universities. The department is truly international: we are familiar not only with Castilian Spanish, but also Latin American varieties. Our students know they won’t get red wine when they order ‘tinto’ in Colombia! 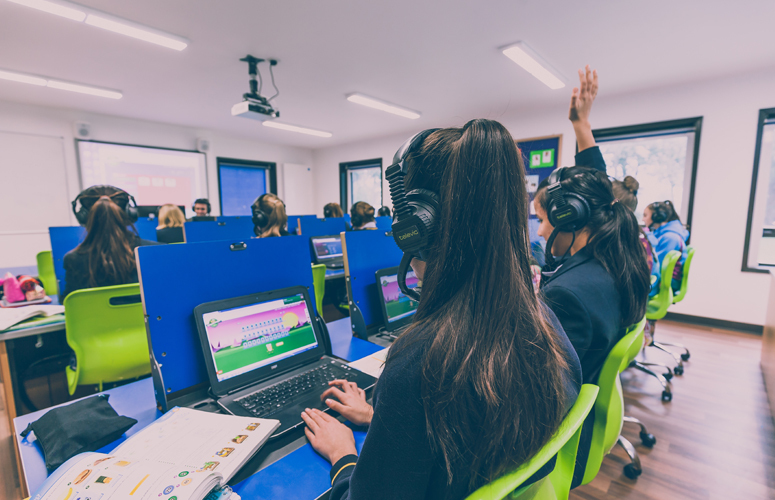 From the beginning of their studies in Year 8, we place emphasis on teaching Spanish in ways that foster greater awareness of English grammar and associated improvements in verbal reasoning. The AQA course helps students develop confident, effective communication skills in Spanish and a thorough understanding of the culture of countries and communities where Spanish is spoken. It develops an interest in, and enthusiasm for, language learning and encourages students to consider their study of the language in a broader context. “My teachers have always made our lessons engaging and their encouragement has meant that Spanish is definitely still a possibility for me next year as an A Level” (former GCSE student).